Tens of millions of years ago, plethodontid salamanders evolved a bizarre system of chemical communication in which courting males "vaccinate" females with a pheromone produced by a gland on the male’s chin. In their subsequent history, plethodontids modified this pheromone delivery system in a variety of ways, evolving other methods of pheromone delivery. This chemical communication system – unique among vertebrates – has been retained by the diverse tribes of plethodontids throughout their evolutionary radiation. We have established that the plethodontid pheromone blend increases female sexual receptivity, indicated by faster time to insemination during courtship. We have also determined both the amino acid sequences of individual pheromone components and the nucleotide sequences of the genes that produce those components, establishing that the pheromone is a blend of proteins from three unrelated families. The phylogenetic setting for these discoveries offers an outstanding opportunity to investigate the evolution of the causal pathway from gene to protein to behavior. This project seizes that opportunity and pursues it in a conceptual framework that is generally applicable to the study of evolution at multiple levels of organization. FROM MOLECULES TO MATING The opportunity presented by the plethodontid courtship system is exceptional because of the direct path from gene to behavior. It is rare to connect a particular gene to behavior, and especially to an important behavior. The important behavior in our system is female sexual receptivity, a behavior at the crux of burgeoning research in the field of evolutionary biology. Receptivity is a central issue – perhaps the central issue - in sexual selection, sexual isolation, and speciation. By discovering the only vertebrate pheromone known to alter female receptivity and establishing that it is a protein, we have opened an important window on evolutionary pattern and process. The aim of this project is to look through that window at multiple levels: at the level of the genome, at the level of expressed protein, at the level of neuroendocrine pathway and at the level of female sexual receptivity. EVOLUTION AT DIFFERENT LEVELS IN A FUNCTIONAL COMPLEX In this project we tested for alternative evolutionary modes (stasis vs. rapid change) at multiple levels in a chemical communication system. There is no one unifying construct that makes theory-based predictions at all levels (e.g., from proteins to neural response). Sexual selection theory, for example, can address expectations concerning a male signal and the female response, but offers little insight into structural changes of a three-dimensional protein signal. We therefore used a variety of perspectives to make predictions about evolutionary stasis or change. These perspectives make contrasting predictions. Our goal was to assess which perspective(s) best predict the evolutionary mode each level of our signaling system. Also, if we discover that stasis, for example, characterizes signal evolution among species having an olfactory delivery mode, does stasis also characterize female behavioral and neural response to this signal? (1) A sexual selection perspective on communication systems predicts either stasis or rapid evolution, depending on whether selection acts on the receiver. 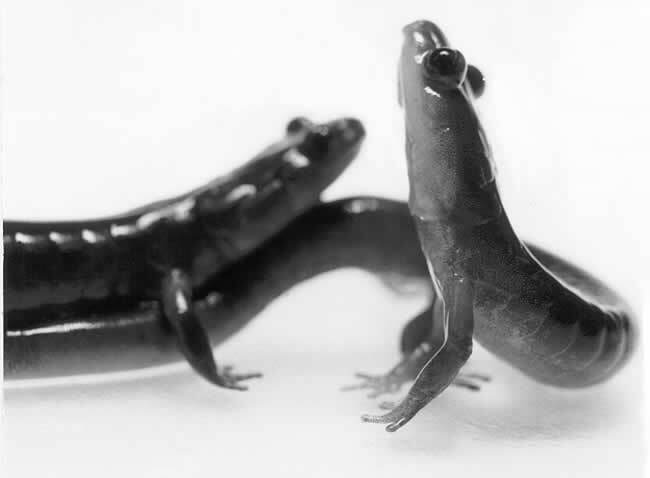 (2) An empirical perspective based on observations of morphological and behavioral evolution in Plethodon salamanders – predicts either stasis or rapid evolution, depending on which branch of the phylogeny is under scrutiny. (3) A neurophysiological perspective based on the pathways mediating female behavioral response to the male signal – suggests that radical change in both the signal and receiver should co-occur in one particular branch of the Plethodon phylogeny. (4) A molecular perspective on the cytokine protein family to which one of the pheromone signals belongs suggests that some parts of the pheromone signal should be static (e.g., binding sites), but other parts of the molecule should be capable of rapid evolution. (5) A molecular perspective based on recent case studies of proteins suggests that our pheromone signals are candidates for rapid molecular coevolution. (6) Preliminary analysis of pheromone gene sequences from four Plethodon species reveals rapid, selection-driven evolution of some parts of one pheromone molecule. Taken together, these perspectives motivate a research strategy in which we focus tests on particular branches of the Plethodon phylogeny. We ask whether the same kinds of selection (stabilizing or diversifying) and same evolutionary mode prevail at all levels of the signaling system.